Do you wish you knew somebody in Berlin who could help you decide where to stay and what to see? Whether you travel alone, with family, or in a group, I will help you plan your trip and show you around once you get here: On foot, by car, or by bus. Get the support you would get from a friend or relative! I’ll also suggest restaurants and help purchase concert tickets. If I am not available, one of my guides will be. My name is Jo Eckardt. I lived in New York for 19 years teaching German at NYU and working for the UN. In 2001 I returned to Berlin. Even though I still miss New York, I don’t regret the move. Berlin is a great place and I’d love to show it to you! Now you can book your tour directly. Just click on the green Book-now-button! However, if you’re interested in a completely customized tour, or if you have questions, please feel free to send me an e-mail. I’d be happy to answer your questions, and book a tour that fits your needs perfectly. Also if your group is more than 6 people, please contact me directly! Claim your free audio tour! More Languages: In addition to Spanish, French and Italian tours, we now also offer tours in Hebrew, Portuguese, Thai, Chinese, Russian, Greek, Dutch and Polish! Oct. 11-20 Berlin Illuminated (Festival of Lights) Berlin landmarks are illuminated – spectacular sights not to be missed! Dec. Christmas markets Don’t miss! Concerts: When in Berlin, check out the free Philharmonie lunch concerts every Tuesday! Boat tours through Berlin: You may not know this, but Berlin has more water ways, canals, rivers, and lakes, then almost any other city in the world. 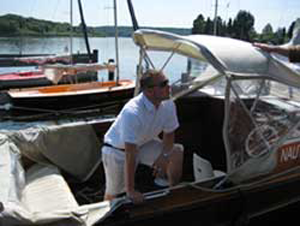 A tour in a small private motor boat will be the highlight of your stay!